The window kits are meant to complement the bath and shower enclosures and can be installed in a few minutes. There is no grout to attract mold or mildew. Renovate your bathroom in a single day with our bath enclosures, shower enclosures and window kits. 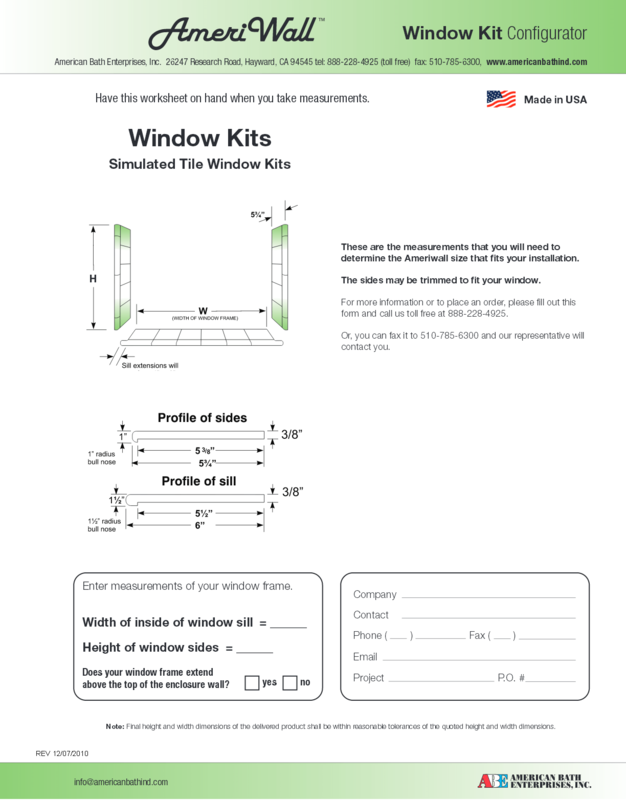 A double window kit consists of two sill pieces (sized from 16” to 48” wide) and two 48”side pieces. If the entire window frame is within the back wall of the enclosure, then a double window kit is needed. Step One: Install the left wall panel following the AmeriWall™ installation instructions. Step Two: Measure from the top of the bath tub or shower pan to the bottom of the window sill (Note: Add 1/8” to each measurement). Step Three: Measure from the edges of the back wall panel to the edges of the window frame(Note: Add 1/8” to each measurement). Step Four: Trim left vertical side of the back wall panel if needed. Step Five: Dry -fit the back wall panel and draw a line on the sheetrock to mark the height of the wall pane. Step Six: Measure from the top of the window frame to the top of the wall enclosure. Step Seven: Cut back wall panel to fit window frame opening. Step Eight: Clean the trimmed edges and dry-fit back wall panel for proper fitting. Step Nine: Apply adhesive around the window frame. Step Ten: Apply adhesive to back wall panel and install. Step Eleven: Measure the width and depth of the window sills and the depth of the window sides for proper fitting. Step Twelve: Turn the window sills upside down, measure from the top edge of the bullnose and cut to fit the window frame. Step Thirteen: Trim window sills’ width and depth. Step Fourteen: Dry-fit window sills and side pieces (NOTE: Brace the top sill if required). Step Fifteen: Measure depth and width of window sides. Step Sixteen: Cut 1” off the top and bottom of the side pieces then trim the side pieces to fit between the sills and header. Step Seventeen: Dry-fit window sills and side pieces. Step Eighteen: Clean all seams and outside perimeter of the window kit with Denatured Alcohol before applying White silicone.